Sunday April 29, 2012 - Mass selective amnesia sweeps APC corridors - Twenty years ago today Sierra Leone got rid of the repressive, suppressive, undemocratic and human rights-abusing authoritarian regime of the APC. After 24 years of uncaring rule during which perceived opponents within and without the party were routinely subjected to the machinations of a judiciary and parliament manipulated by the Executive that Wednesday action of 1992 brought to an end an ogre that was busy fattening itself on the nation's resources even as the population cried for relief. 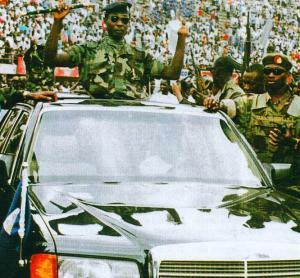 It was on a Wednesday morning - yes - on April 29, 1992 when residents in the capital Freetown were treated to, for the first time, a sample of the sounds from the war front in the east of the country where soldiers were battling forces of the Revolutionary United Front led by one former army corporal - Foday Sankoh. Before then, all that residents of the capital knew about the war that was raging in the country claiming lives, livelihoods and security of the Sierra Leonean were despatches heard on international radio and other media outlets about advances and/or reverses made by government soldiers sent to the front by their APC overlords. The overlords in the meantime refused to pay heed to the injustices meted out to a cowed population. They continued giving deaf ears to the loud and silent cries of the population as the looting of state and other resources went on an even higher level. Democratic means to have a change of government, the main item on the menu of frustrated and angry Sierra Leoneans fell on deaf ears - those suspected of not reading from the same sheet as State House headed by one Siaka Stevens, followed by his own chosen heir Joseph Saidu Momoh - were subjected to massive human rights abuses ranging from illegal deprivation of basic freedoms to long term incarceration and the gallows at the Pademba Road execution chamber. Those were the times when to live like a Sierra Leonean and be appreciated as such in your own God-given land, you had to join the All Peoples Congress party and it was a fitting tribute, a wake-up call to the overlords when on Wednesday April 29, the khaki boys, sorry me, came to town, ostensibly to air their grievances against the lack of essential support in the battle against Foday Sankoh forces. It must be put on record again that recruitment into the army and indeed opportunities of any nature at the time was a party affair. You had to belong to the APC to become a soldier and even then, you had to have the backing of top party members to be given the opportunity to die for your country. It was a time when APC party officials introduced "the green card". This was a card that the prospective soldier must present to the recruiting officers to have any chance of getting into the army. 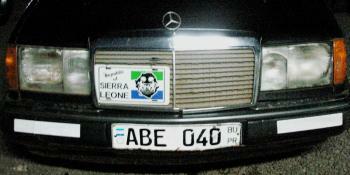 It was not only party officials and other key government functionaries who dished out the green cards - relations including concubines and close associates also became recruitment agents as the APC government ensured that all those who were in the army were men and women they could trust to protect and defend, not the entity called Sierra Leone, but a horror called the ACP party. And so when the first shots were heard from that twin-barrelled anti-aircraft gun mounted on a truck outside the gates of State House boomed out, there was much gnashing of teeth, shaking of many a part of the human anatomy as it slowly dawned on the overlords that something threatening their 24-year hold on power was in the making. Curious, yes curious residents of the capital, after overcoming their initial fears, made their way in droves to the source of the sounds - State Avenue but keeping well away from the the gates of the citadel of power. Activity around the gates with soldiers moving in and out of State House could be seen, discerned by the curious and swelling crowd of onlookers gazing in some kind of awe at this gun which was being operated by soldiers in harnesses attached to the weapon. They could not help noticing that the twin barrels were pointed and directed away from the city with barrels seen to be directed towards the sea. The soldiers at the gates were later to inform a group of journalists that this line of action was deliberate - to assure the civilian population that they were not in town to create mayhem among them but to meet with their Commander-in-Chief President Joseph Saidu Momoh who was yet to leave his official residence along Spur Road for State House his usual place of work and other duties - state and not so stately. As a rather anxious population waited to hear about the next stage of the unfolding drama, President Momoh issued a statement in which he roundly condemned the soldiers who had blocked his entrance to State House labelling them as "misguided" - a term often used by the President's speech writers. If the President and the speech writers believed that such an uncompromising stand would muster resistance against the men and the guns at State House, it had the opposite effect when later that evening came the rather breathless voice of one Captain Valentine Strasser who told the nation through one private FM radio station that they had overthrown the government of President Joseph Saidu Momoh and they had ended the 24-year horrible and uncaring despotic rule and hold of the APC party. Reaction was electric - how can soldiers dare succeed in overthrowing a party with a record of hanging key members of groups who dared to dream of taking out the "rule forever APC"? How sure were they of succeeding, of not been betrayed by APC operatives within the army itself? It was as if this was what the people had been waiting for - people meaning the more than 99 percent of Sierra Leoneans who lived by the day not knowing what new oppressive measures the government would push through to facilitate increased looting of state coffers with impunity - many poured out into the streets in support of the coup - there were celebrations all over the country with students and school children leading the parades that welcomed the new government in power - the National Provisional Ruling Council, the NPRC headed by Sierra Leone's youngest if not the world's head of State 26-year old Captain Valentine Strasser. And now 20 years later and fifteen years out of power until 2007, the APC is back at the helm of affairs. Instead of taking a second and even third look at the reports of the three Commissions of Inquiry which exposed the thieving and various excesses of 24 years of despotic rule, the new leaders of the APC now in government since 2007 have instead embarked on a mission of "recovery" backdating looting sprees to cover up for the 15 years they had been out of power. Corruption has taken a more daring and bold hold on all things public and private in the affairs of state with Ernest Bai Koroma allegedly massaging various bank account and making all manner of unsavoury deals with mining companies and questionable "investors" whose main aim is to rip off the country's natural resources as these get mortgaged by a "government" the head of which is steeped in corruption. While fellow Sierra Leoneans continue to wallow in abject poverty and could not get their own money from commercial banks, Ernest Bai Koroma has been busy dishing out dollars, raw dollars and other foreign currencies in cash to every and anyone who heaps praises on him speaking and printing in glowing terms of just how well he has been doing even though he knows this is quite on the contrary. The reports of the three Commissions of Inquiry together with the Government White Paper Thereon should be available at the Government Bookshop along Lamina Sankoh/Wallace Johnson Street and should be quite an eye opener to the grandsons of the nation wreckers who had no inkling of what their relations did to Sierra Leone during their 24 year grip on power. There was the Justice Laura Marcus-Jones Commission of Inquiry - this body was charged with the investigation on the "assets, activities and other related matters of Public Officers, Members of the Board and Employees of Parastatals, Ministers of State, Paramount Chiefs; and on Contractors - within the period 1st day of June, 1986 to the 22nd day of September, 1991". Quite an eye opener that gives you an idea of just how corrupt the APC government was and is now. The Beccles Davies Commission of Inquiry had this mandate - "To examine the Assets and other related matters of all persons who were President, Vice Presidents, Ministers, Ministers of State and Deputy Ministers from the 1st day of June, 1986 to 22nd day of September, 1991 and to inquire into and investigate whether such assets were acquired lawfully or unlawfully". This Commission's report and subsequent Government White Paper published for general distribution was the most damning indictment on the gallery of rogues, thieves and state looters and should give a broader picture of just what can be expected of a beneficiary of such massive corruption who is now Sierra Leone's President. Kindly get copies of all the reports and try to take in the depraved minds that brought Sierra Leone to her knees as during the looting spree, the APC functionaries passing off as ministers and state officials fought against each other as wild hyenas would do while feeding on the carcass of some poor creature. Here's a sample. With elections less than a year away and with signs that he would not be getting his much-desired second term at taking Sierra Leone to the cleaners even further, a clearly desperate Ernest Bai Koroma has resorted to every trick in the books of the APC to hold on to power - importing war weapons for the armed wing of the APC now known as the OSD. The training of many of these personnel is believed to be going on in full swing at the home of the original training grounds of the forerunner of the now tagged OSD, the ISU - Internal Security Unit in Samu. Though the budget calls for the training of 300 new soldiers and 1000 new police personnel, reports on the ground speak of many more OSD recruited in readiness for mayhem and violence planned against members of the opposition. Kindly allow us, we plead to quote something from the pages of Volume Seven of the Beccles Davies Commission of Inquiry and one case in point against a Minister of State who refused to be bent by the hurricane of corruption that was blowing across the halls and offices of state institutions during the rule of the APC under the period reviewed by the Commission. It is about one Christie Greene - remember him? Yes - the former athlete and Accounts and Money Matters expert who went into politics without knowing what he was letting himself into. He learnt some bitter lessons. On Page 25 of that volume would be found this - Poor Christie had fallen foul of his comrades because he had dared question some papers brought to him for his signature. He took one look at them and refused and he was framed and sentenced to jail - all manipulated by the then Inspector-General of Police at the time because he had dared question expenses related to the police. "I did that. I tried to talk to them about it. They advised me not to withdraw the appeal. But my life was much, much more expensive than the appeal. I had to instruct them to withdraw the appeal. One day I returned from court, I returned from town and my children told me that two people in uniform had gone to the house and wanted to know the security arrangement at my home. They were then about eight and four years old respectively. They were told that a Mr Newlove of Congo Cross Police station had sent them. So I went straight to him at Congo Cross Police station. When I asked him, he was surprised. In fact that very night he provided two armed security men for my home. I also spoke with the then Chief of the Special Security Division, Mr Sima Dumbuya and he provided another two security officer for my home. That very night I remember there was some shooting around my home and it was alleged that there were certain people who wanted to come into my place. Soon after that I was driving from Wilberforce down to town. I had my cousin who usually drove me around, but this day I said to him I'll take you home and then drive back. I noticed a military Land Rover driving behind me. I became suspicious and I drove up Hill Cot road and it followed me. I went straight to Hill Station Hospital and waited there for quite some time. On my coming down later on, I was driving down King Street from Wilberforce to Congo Cross. I saw the same Land Rover coming up by the curve and I moved on to the side and parked and the Land Rover hit my side and my car was thrown over on to the precipice my Lord. The officers alighted from the care and attacked me, were it not for for the watchmen up at King Street, I don't know what would have happened to me. I reported the matter. In the first place I went to Congo Cross Police station. Policemen were sent there they looked at the scene. Luckily for me I could not drive the car but the car was damaged. It took me some time to get on the street, for a long time I didn't come out of my house. In fact at some I was sleeping in a church - let me tell you this, I was sleeping in a church. I moved from my home because I was harassed. I spoke with the Inspector-General and he said to me that if I could not identify anybody he had nothing to do about it. So that was the end of it, so that was my plight, I have lived with it."